Overlay of Michler 4" = 1 mile map (1867) and modern elevation data, noting approximate camera locations. This is an interesting portion of the battlefield that preserves an intact portion of the zig-zag covered ways that fed Union lines fronting The Crater. 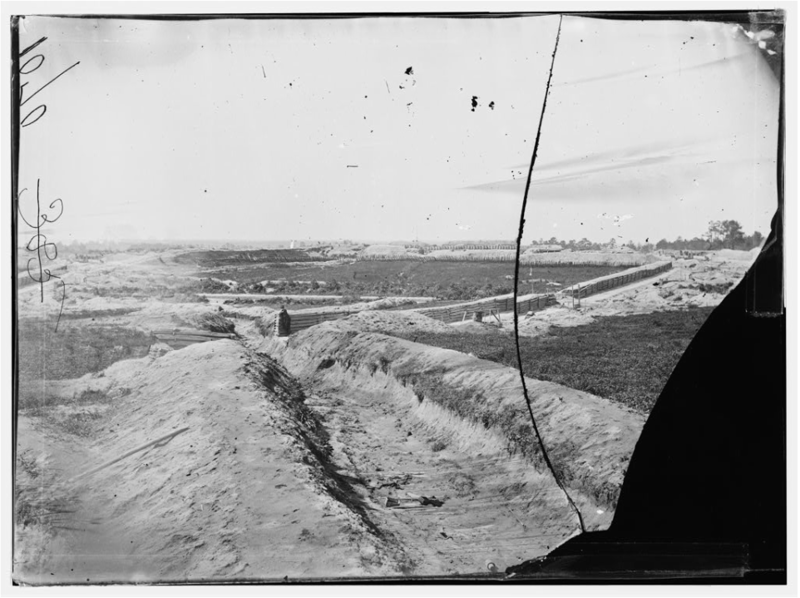 Timothy O'Sullivan and his assistant exposed at least seven stereographic images in the vicinity of Fort Morton, Battery XV, and Battery XVI, while parking their wagon on Baxter Road. From the depth of the shadows, it would appear that the images were taken mid-to- late afternoon, date uncertain, but certainly in the first week of April 1865 within a few days of the fall of Petersburg. The map above is a GIS overlay of the lithographed Michler and Weyss Map of Petersburg and Five Forks (1867) and modern LIDAR data. Fort Morton and Battery XV were leveled after the war by "Old Man Taylor" on whose farm these had been built. Much of Battery XVI was lost to later highway development, but a substantial portion of it survives, including the camera position of one of the photos (01323). The stereographs are presented below (in numerical order according to the Library of Congress digital file number). Links take you to the original images in the Library of Congress collection. Fort Morton was leveled after the war for agriculture, but its subterranean trace was revealed by recent work conducted by Julie Steele and a team of National Park Service archaeologists. So that visitors can grasp the size and tactical siting of the fort, park maintenance crews have created a "ghost" outline on the ground with crushed oyster shells. No trace of Battery XV remains above ground. O'Sullivan's stereographs are the best evidence we have of the appearance of the landscape in April 1865 and are likely to guide future archaeological prospecting when funding is available. 00517. Previously unidentified and unattributed view of Fort Morton taken from the northern wall of the fort, looking south. (LC-DIG-cwpb-00517) Two magazines on the right (one topped by the flagpole) were directly behind the front gun wall. "Vest Man" (O'Sullivan's assistant) is posed in the covered way behind the magazines. Detail from the above image, showing O'Sullivan in the foreground drinking from the well. In the background a horse is harnessed to a supply wagon waiting in Baxter Road. There may have been other exposures from this vicinity that have not survived. 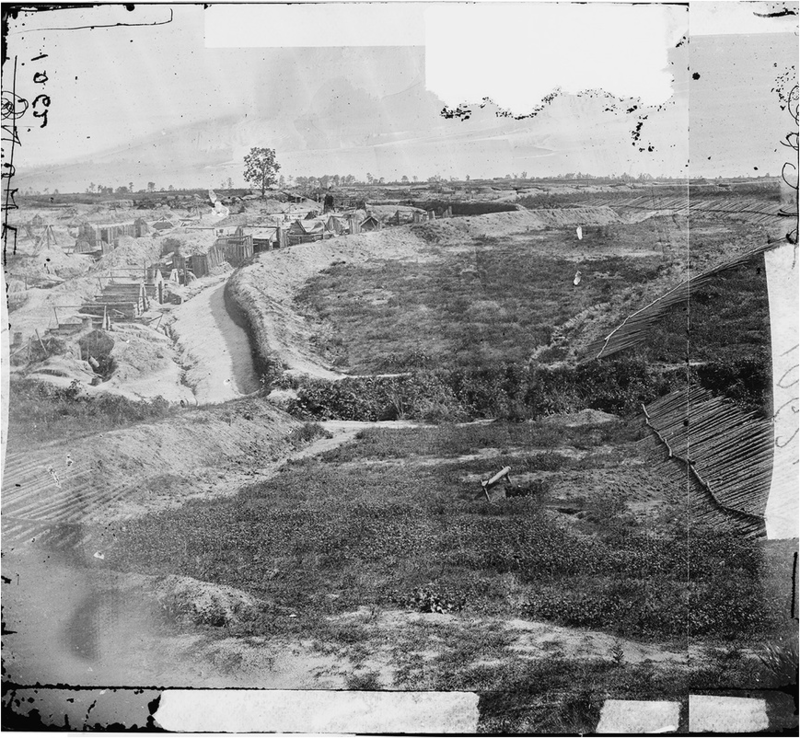 Had the camera lens been shifted 90 degrees to the west, we would have had a head on view of the Taylor Farm and The Crater as these appeared in April 1865. Schematic of photograph 00518 (above) by Philip Shiman. 01323. View of covered way leading out of Battery XVI with Fort Morton in the background at right center. (LC-DIG-cwpb-01323). Baxter Road crosses the center of the image and passes through a gap made in the curtain wall to facilitate the forward movement of Union troops. This is the right half of a damaged stereograph. 01321. View from the left flank of Battery XVI, looking south along the Union lines. (LC-DIG-cwpb-01321). This is the left half of a stereograph. Note the inclined fraise of sharpened logs and the latrine or "sink" at right center. 00529. View of the interior of mortar Battery XV, from the right flank of the battery looking south. 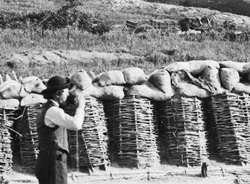 (LC-DIG-cwpb-00529) O'Sullivan's assistant, Vest Man, poses at a mortar platform in the middle distance. 00530. View of the interior of mortar Battery XV, from the right flank of the battery looking south. (LC-DIG-cwpb-00530). The camera position did not change from the previous photo, but after setting up the shot and exposing the first image, O'Sullivan exchanged places with his assistant. 00533. 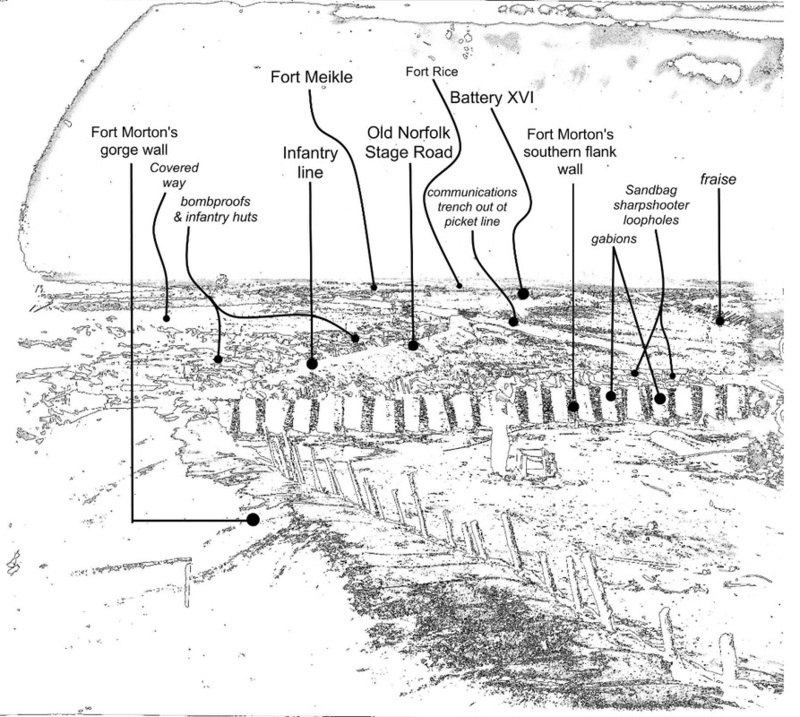 Labeled "Confederate Fort McGilvery," this image was taken from behind Battery XV (LC-DIG-cwpb-00533). Background and chimneys can be linked with the previous images. Photographer Timothy O'Sullivan poses by the chimney in the mid-ground.